This novel is set between the years 2006 and 2008 with much of the action taking place in the drawing office of the Wilkinson's Engineering Works in the fictional South Lancashire town of Ashurst. 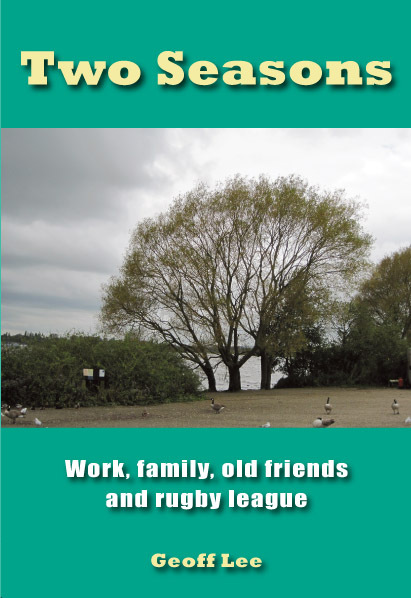 It is the sixth in a series about northern working class life and is inspired by Geoff's love and links with the sport of rugby league and the old saying about work that “They could write a book about this place. It would be a best seller”. The main character continues to be the draughtsman Alan Greenall along with Thelma, who in “One Winter” had drifted north from Cardiff into the town during the summer of 1962. By the time of “Three Good Years”, they are married with two children Rebecca and Robert and two soon to be three grandchildren Josh, Joanna and then Daisy. The Greenalls are both keen rugby league fans watching the Saints at home for every game and frequently enjoying their trips into Yorkshire, particularly to Headingley, Odsal Stadium and Wakefield. They are also keen Crown Green bowlers with Alan a regular member of the Southport Edge Miners' Welfare club. He still works at Wilkinson's with the firm now run from a company in Amsterdam. In 1962 over 8,000 people worked there but now that number is down to little more than 300. Among some of the interesting chapter titles are The Jehovah's Widnes, Lord Beeching has been beaten before, “I follow Marlborough League”, Callaghanism and Neo Liberalism and The Church of the Everyday Saints along with the cliff hanger “He's in St Helens Hospital”. One moving story told is about the details of Thelma's mother who had died in 1944 when Thelma was less than a year old. It is discovered that she had grown up in Tiger Bay and may well have gone to the same school around the same time as Billy Boston, Johnny Freeman and Shirley Bassey had gone there.